When Microsoft debuted its Windows Holographic software and HoloLens headset a few months back, Windows 10 apps were mentioned as a possibility. 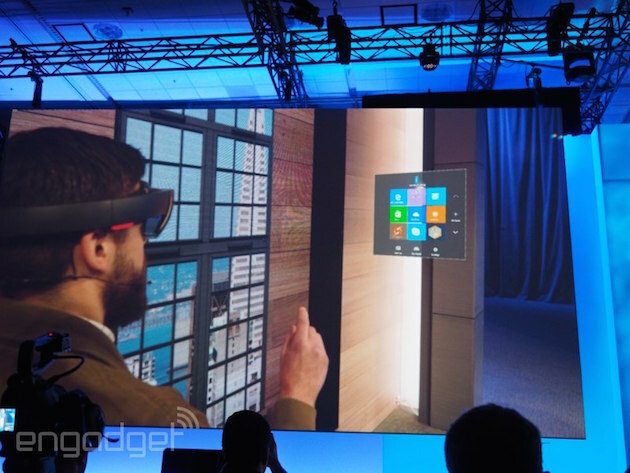 Well, at Build 2015 today, the folks in Redmond offered a look at Windows 10 Universal apps in holographic action. 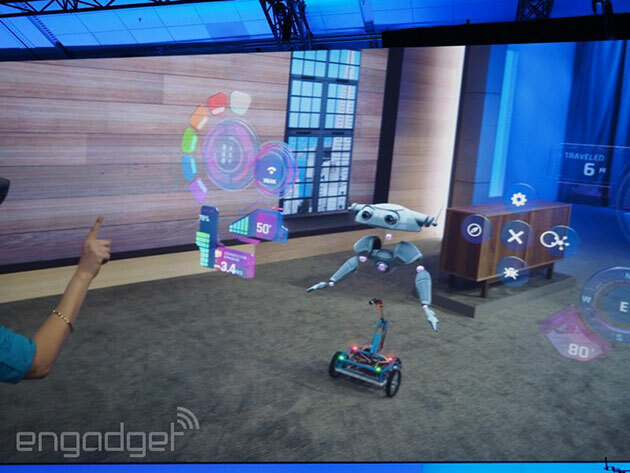 During the onstage demo, apps could be placed on walls or set to float in space, and resized based on the user's needs -- something we'd only seen in videos up to this point. Of course, this means that users in different locations can collaborate on 3D models without having to be in the same room. Any Windows 10 app can be used as a hologram with the headset, so getting work done at a place other than your desk will soon be a possibility. With those apps in play, you can overlay a hologram on top of a physical object and make tweaks without heading back to the keyboard. Just like the real and virtual robots we saw onstage, you wrangle simple changes, like the color of an LED, with gestures and the projected UI. Microsoft partnered with Case Western Reserve University to develop medical solutions for the platform, and those were shown off, too. Up-close examinations of the nervous and skeletal systems are now possible without the use of cadavers, and each of the body's systems can be displayed as a separate model in seconds. For architects, Windows Holographic brings the ability to walk through buildings without leaving the office, or through those projects that are still just blueprints. Of course, we'll have to wait and see what the final version looks like, but Microsoft's vision for how we'll work in the near-future is pretty enticing. Out of a batch of 200 such wafers created for the study, only two failed -- that's a 99 percent success rate. With these results in hand, the research team hopes to streamline the manufacturing process as well as improve the consistency of the resulting film. The technology is still at least a few years away from being commercially viable but when it is, we could see it usher in a new era of paper-thin, super-powerful electronics. Day one of Microsoft's Build 2015 conference is in the books, but that doesn't mean the news has stopped. 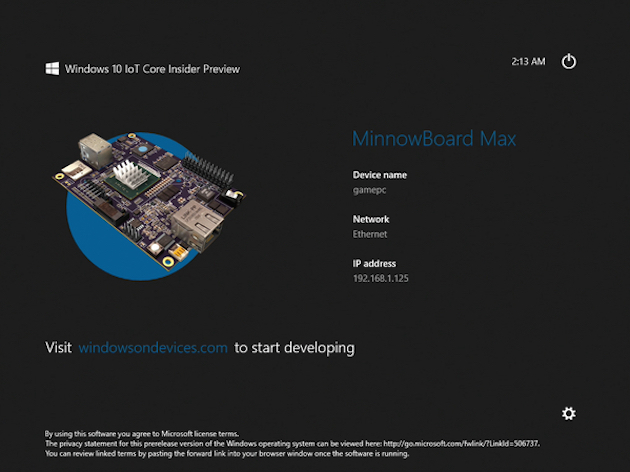 The Windows 10 IoT Core Insider developer preview (phew!) has launched for small devices including the Raspberry Pi 2. Redmond admits that it's still pretty rough around the edges, but it's hoping that the maker community can provide feedback for how the platform's turning out along the road to a full release. What's more, the software giant is partnering with Arduino for a series of "Arduino Certified" products to bring the ubiquitous DIY boards into the Windows family and take advantage of all that the software has to offer. 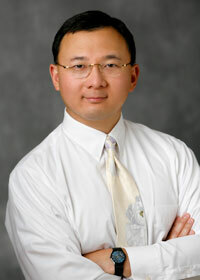 For example, cloud computing, a familiar user interface, image processing and a ton more. It follows the theme of bringing everything under one roof that Nadella and Co. have been so vocal about lately, and should hopefully help tinkerers develop some pr! etty pow erful stuff in their garage.